WING & A PRAYER PLANTATION HOUSE STYLISH HAMMERED COPPER ROOF FOR SONGBIRD LOVERS! Wing & A Prayer Plantation Wild Bird House, Hammered Copper Roof This Wing and A Prayer Plantation Bird House will certainly be desirable for a group of birds to establish a colony in your yard! This home houses eight separate birds at once. Ledges around the base of each level help divide the home, as well as offer a perching or takeoff spot for fledglings. This bird house has Vertical panels that lend a classic design look, and the white color adds a crisp feel. Each 1.5 diameter entrance hole is surrounded with a metal predator guard, matching the copper color and finish of the roof for added dimension. A white finial tops the piece, adding height to the unit. Remove the roof and each floor in the house for seasonal cleanings and nest checks, to keep it usable for the next year. The hammered finish on the copper colored metal roof adds an elegant look to the Home. This house is constructed of solid PVC trimboard, and is designed not to mildew, mold, or delaminate with exposure to the elements, and will remain stable for up to 25 years. Use the preinstalled mounting collar to connect this bird house to a 4" x 4" post (not included). 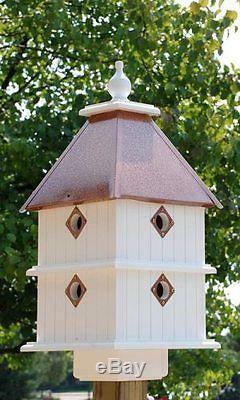 House several birds in your garden by putting up this Plantation Bird House with Hammered Copper Roof. I will never knowingly try to mislead you in any way. I do my best to describe everything I sell but I'm not perfect. People do have differences of opinion. I really do take pride in my feedback and try to keep it as perfect as possible. The item "WING & A PRAYER PLANTATION HOUSE STYLISH HAMMERED COPPER ROOF SONGBIRD LOVERS" is in sale since Monday, April 23, 2018. This item is in the category "Home & Garden\Yard, Garden & Outdoor Living\Bird & Wildlife Accessories\Birdhouses". The seller is "jacobsoutdoor" and is located in Cambria, Wisconsin.